An anti-imperialist political and trade bloc founded in 2004 by Cuba and Venezuela to challenge US hegemony and promote solidarity-based trade, ALBA now involves 11 Latin American and Caribbean nations. ALBA's statement to the 2009 climate summit in Copenhagen pointed out that the climate crisis was the result of the “imposition of an absolutely predatory model of development on the rest of the world”. In Paris, at the annual polluters' jamboree called the United Nations Climate Change Conference, or COP21, it looks like more of the same. 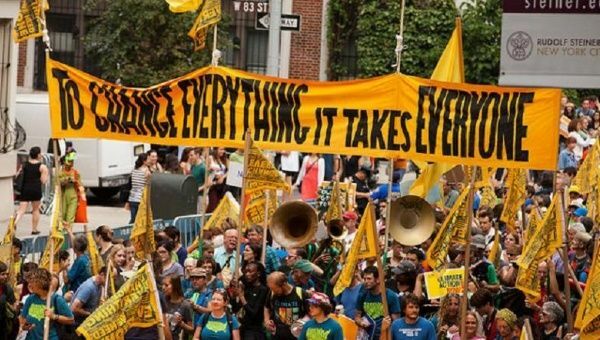 At these climate talks, running November 30-December 11, social movements and government representatives will be fighting over the shape of tomorrow. One can sketch out two general perspectives. As The Guardian calmly noted, the energy corporations “stopped short of outlining clear goals to limit emissions”. In other words, business as usual. ExxonMobil, meanwhile, is in a league of its own, openly accused of “deceiving the American public” about the risks of climate change to protect its profits. US President Barack Obama's proposals for Paris generally fall in line with the needs of these energy companies – no surprise. The US's Intended Nationally Determined Contributions (INDC, or each countries' plan for reducing emissions) foresees a 17% cut from 2005 levels by 2020. Climate Analytics calls this “the least ambitious end of a 2°C global emissions pathway”. This means that “other countries would have to make more comparable effort than the US to keep the world on that pathway”. The New Climate Institute insists such cuts are “already at the limit of what is politically feasible”. They are, of course, fully in line with Obama's broader climate change plans, which leading climatologist James Hansen has called “practically worthless”. That is the Democratic Party. And then there is the rest of humanity – social movements, unions, community groups, farmers alliances and left governments – practicing what ecological economist Joan Martinez-Alier calls “the environmentalism of the poor”. Among such forces, there are three core areas of agreement. One: the climate debt to the developing world must be paid. Two, the poor have a right to development. And three, there is differentiated responsibility between rich nations – responsible overwhelmingly for the crisis - and poor nations. Venezuelan foreign minister Delcy Rodriguez said there is a “historic debt and ecological debt from the rich countries, to the poor ones”. The Bolivian government has crunched the numbers and shown that, of the 2000 gigatons of carbon dioxide emitted since 1750, the overwhelming majority has been by Annex I countries – the global North. Much of the corresponding non-Annex I emissions (from poor nations) during historical periods of colonialism and neo-colonialism actually came from activities that enriched the global North corporate interests and imperialist countries. This amounts to a climate colonialism expressed through the control of atmospheric space. As a remedy, Bolivia calls for adopting “a new model of civilisation in the world without consumerism, war-mongering, and mercantilism”. It adds that the world should “allocate the resources of the military machinery of the imperial powers and the war-mongers to finance the activities of the peoples against climate change”. Ecuador, also a non-Annex I country, notes that its climate proposals and development plans are based on a “new vision [which] references sustainable and harmonious management of nature with consideration to its limits and regeneration cycles”. Such plans make clear that the country is doing its best to promote the decarbonisation of its energy resources, while still attending to the desperate human needs of its population. Such proposals put the debt and the responsibility for accelerating this process on the global North, through technology grants. It pushes the “identification of areas vulnerable to drought and land degradation in order to promote sustainable land management practices and water catchment systems”. For its part, the international peasant group Via Campesina calls for food sovereignty, “based on peasant agroecology, traditional knowledge, selecting, saving and sharing local adoptive seeds, and control over our lands, biodiversity, waters, and territories”. The group, which represents about 200 million farmers and is often described as the world's largest social movement, insists that this “is a true, viable, and just solution to a global climate crisis caused largely” by transnational corporations. It says these policies require “comprehensive agrarian reforms, public procurement of peasant production, and an end to destructive free trade agreements promoted by [transnational corporations]” in order to develop properly. Former Bolivian climate negotiator Pablo Solon observed: “The position of developed countries in general tends to water down the difference between developed and developing countries, promoting more the use of 'all parties' (134 mentions in the text). As well as the social movements and left governments, there is an important group formed by developing countries most exposed to climate change: Afghanistan, Bangladesh, Barbados, Bhutan, Costa Rica, Ethiopia, Ghana, Kenya, Kiribati, Madagascar, Maldives, Nepal, Philippines, Rwanda, Saint Lucia, Tanzania, Timor-Leste, Tuvalu, Vanuatu and Vietnam. They have suggested that a 2°C rise is already too high and may demand a lower limit.